BRUSSELS, Belgium -- Ukraine has long been seeking to alter the terms of the 2009 gas deal it signed with Russia. The contract says Ukraine must import no less than 33 billion cubic metres of gas from Russia, but Kiev is insisting on reducing both the price and the volume of gas imports. Ukrainian Premier Mykola Azarov has stated that Kiev is ready to pay $400 per 1,000 cubic metres of gas if it fails to agree with Moscow on better terms for gas supplies. "If we have to pay $400 for gas, we will pay it – we have no other choice," Azarov told reporters in Kiev on 13 December. The government cannot delay the drafting of the 2012 national budget any longer, because it has to be adopted by the New Year, he said. Azarov added that Ukraine-Russia negotiations had been going on in Moscow for two days. Gazprom CEO Alexei Miller announced earlier last week, however, that "no New Year's presents" should be expected in bilateral talks on the reduction of the price for Russian natural gas. Kommersant reported on 13 December that Gazprom might lower the gas price for Ukraine to $210-220 per 1,000 cubic metres if Kiev sold part of its gas transportation system to Moscow. 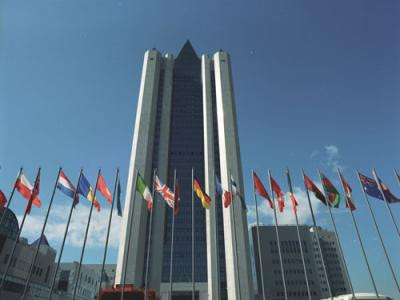 A similar scheme was adopted by the gas monopolist in early December, when it announced that it took control of Beltransgaz as part of a revised energy deal with Belarus. The Ukraine- Russia deal would exclude European participation. Miller met Ukrainian Energy Minister Yury Boiko on 12 December, Gazprom said in a statement. Joint control of the transit pipelines, which carry Russian gas to Europe through the territory of the former Soviet republic, is seen as a way to preclude their use as a bargaining chip in price conflicts between Russia and Ukraine, which depends on Russia for almost all of its gas. Direct European participation in a pipeline deal had appeared possible. Azarov said earlier that they had discussed a 40-40 division of control between Russia and Ukraine, with a European entity as a third party. Russia annually pumps around 100 billion cubic metres of gas to European countries via Ukraine, which makes up 80% of its total gas supplies to Europe. Meanwhile, Naftogaz Deputy CEO Vadym Chuprun was quoted as saying by the press that Ukraine needs guarantees from Russia and the EU regarding gas transit across Ukrainian territory. "It is impossible to preserve and maintain our gas transport system without Russian gas. Our national property - Ukraine's gas transport system - must be preserved, so it needs guaranteed volumes of gas. We need guarantees from Russia and from the European Union," Chuprun said, adding that it was possible to use the Ukrainian gas transport system in full with the trilateral participation of Ukraine, Russia and Europe. "It can be used only at the trilateral level, with Russia being a supplier, Ukraine a transit country, and the European Union as a consumer, on such a solid basis," Chuprun said. He added that the construction of gas pipelines bypassing Ukraine - Nord Stream and South Stream - posed a direct threat to Ukraine's transit potential. "We are surprised that European officials have not responded to [the construction of South Stream or Nord Stream. And silence is a sign of consent. This is a serious signal to Ukraine. This is a direct threat to Ukraine's gas-transport system." Chuprun said that the Ukrainian gas transport system had a unique potential and that it was economically more profitable than the construction of pipelines bypassing Ukraine. "The cost of [the construction of ] South Stream is $27 billion. For the sake of momentary gain, in order to get lower gas prices, certain EU countries forget that in five years they will have to pay for this," he concluded.